In an attempt to juggle the different roles and responsibilities thrust upon us by culture, society and even industry, our enoughness may come into question more often than we would like. Women tend to experience times of ‘should-ing ourselves,’ where we seriously wonder who we should be, what we should look like, how we should spend our time, etc. It’s no different for women in the agriculture industry, except there’s the added pressure of how we fit into the farm business. Many women struggle with their position on the farm and how it coincides with other roles they fulfill. Farmer. Mother. Wife. Sister. Daughter. Daughter-in-law. Friend. Community leader. Employee. The list of roles for women is – and, arguably, always has been – endless. And it’s a struggle shared by our partners too, who are trying to find balance between the pressures of the farm and spending time with family. What it really comes down to is a question of enoughness. Am I enough? Shouldn’t I be doing more? Am I worthy of all the things I want and need? Who am I to want and need these things in the first place? While it’s a natural part of being human to question yourself, things become problematic when you’re unable to answer these questions with honesty and integrity, or to answer them at all. And answer them you must, unless you prefer the continuous whirlwind of self-doubt in your head, sending your mental health over to the dark side. There is a way to quiet that whirlwind while simultaneously securing your enoughness (by the way, you definitely are enough). Doing so just takes a slight adjustment to your perspective - and a little bit of work. Banish the idea that work-life balance is a thing. It isn’t. Let’s talk about guilt for a moment. You know the feeling. That seemingly ever-present weight reminding you that you should be doing something different than packing your toddler into a carseat for a long shift in the combine with you. Or that hesitation and slump of the shoulders when you reluctantly flip the TV on to “babysit” so you can catch up on farm books or housework, or even just cook a meal without interruption. Work-life balance is the notion of giving equal time and effort toward all different aspects of one’s work and personal life. No pressure, by the way. When you inevitably can’t give equal time and effort to all your roles and responsibilities because it’s literally impossible, you end up feeling guilty and overwhelmed. In other words - if you’re constantly striving for something that doesn’t exist, there’s no way you won’t feel guilty when you ultimately don’t achieve it (because it doesn’t exist)! Why not try to prioritize your values and focus on what means the most to you instead of hustling everything that’s asked of you? Courtney Denard is a dairy farmer, journalist and mental health advocate from Southwestern Ontario. 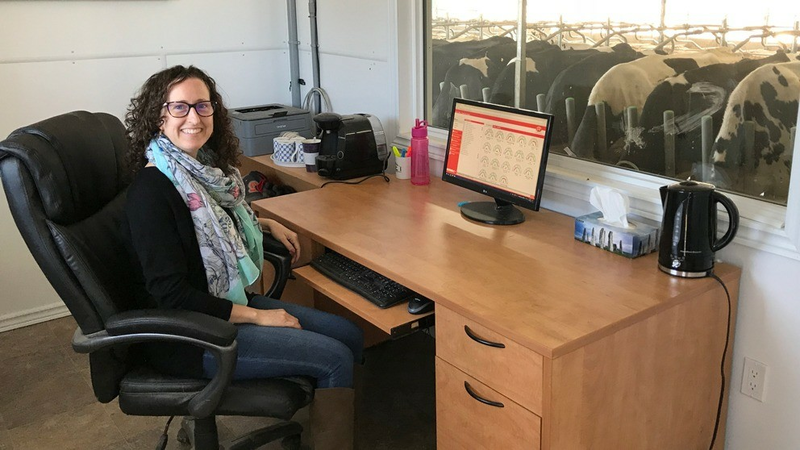 Courtney, who is very open and active on social media, pushes back against the idea of work-life balance by being realistic about farming and the expectations of others. Elaine Froese is a farm family coach, succession planner and speaker, and has a bit of a different – albeit powerful – take on guilt. Speaking of expectations, let’s talk about that next. Managing your own expectations can be really difficult, especially when there’s pressure coming from all sides to “do it all.” It’s okay to sometimes feel frustrated, angry or even resentful toward this pressure. But if you’re feeling that way all the time, it might be worth checking in with yourself to explore why. Sandi Knight is a farm partner, mom, writer and photographer in Manitoba and says aging is a great catalyst for getting real with yourself. Traditional, gender-based expectations exist in the agricultural community and, while there’s nothing wrong with adhering to those expectations, there’s nothing wrong with not adhering to them, either. Every farm is different and every role on every farm is different - and that’s completely okay. The point is to be true to yourself about what you want and how you want to be involved in the farm. Elaine would like to know where the rule book is that outlines all of these expectations for women on the farm. Do you make time for yourself everyday? Not many of us can say yes to that, especially if we’re striving for non-existent balance and our expectations are unrealistic. Many of us grew up with the notion that staying busy was non-negotiable, that you needed to push through feeling sick or run down, and that you didn’t stop until the work was finished, no matter how long it took. In other words, the bigger the sacrifice, the better the reward. But seriously, what’s the reward for working 90 hours a week? Aside from severe sleep deprivation (and in what strange universe is that a reward?). Self-care isn’t the indulgent, narcissistic activity it’s sometimes made out to be. Self-care isn’t the indulgent, narcissistic activity it’s sometimes made out to be. Sure, there are many who believe anything less than a luxurious spa weekend away doesn’t qualify as self-care. But things like getting enough rest, eating a variety of foods you enjoy and participating in activities that you like count just as much toward self-care as sitting in a bubbling bathtub for an hour. Creating a self-care routine is as individual as deciding what you’d like to eat at a restaurant. Everyone will have different feelings around self-care and what it means for them. Nothing is off-limits as long as it doesn’t perpetuate your stress. Start with something simple and meaningful to you and build from there. Realize mental health trumps all. No, seriously. From an early age, we’re taught the crucial importance of physical well-being. We do things like brush our teeth, feed ourselves, dress warm when it’s cold, and visit the doctor if we feel something is wrong in our bodies. No one bats an eye as these activities are considered normal human behaviour. As you sit in a tractor for 12 hours by yourself, or drive 45 minutes into town to pick up your kids from school during a blizzard, or look across a field of wheat that’s just been destroyed by hail – have you ever felt crushed by loneliness? Or failure? Or guilt? In his TED Talk, psychologist Guy Winch says we sustain mental injuries like loneliness, rejection, or failure, even more often than we sustain physical injuries. We have scientifically proven ways to help us overcome these injuries and prevent them from getting worse – but we don’t use them. In fact, we often ignore what he calls our emotional hygiene. Slowly, things like self-care, sharing your struggle with a friend, or seeking counseling are becoming more prominent and seen as necessary to foster overall resiliency in life. Yet the stigma around addressing mental health issues stands firm. Organizations like the Do More Agriculture Foundation are helping to break down barriers by providing the ag community with resources and information to not only show people where they can get help but also help people understand how to begin breaking down the stigma around mental health. As Mahatma Gandhi said, you must be the change you wish to see in the world. That means you need to realize how important your mental health is and begin to care for your mind as you care for your physical body – without shame, guilt or question. As a tenacious advocate for mental health in agriculture, Courtney understands the difficulty of tackling your mental health – but that doing so is entirely worthwhile. Always remember: you do you. Seeing a therapist when she can works for Courtney but you might not be ready for that. And that’s okay. Getting lots of sleep might be great for Elaine, who is a grandmother with adult children. But you might have a six-month-old and a toddler who won’t sleep through the night so getting “lots of” sleep means napping when the kids nap. Sustainable change happens by creating sustainable habits. Each and every person reading this will have a different way of achieving the change they wish to see in themselves. By abolishing the idea of work-life balance, managing expectations, moving self-care up the priority list, and caring for your mental health, the whirlwind in your mind will calm. The need to hustle for, and question, your enoughness will subside as your needs are met and your perspective changes, knowing you are already enough to begin with. If you’re looking for more mental health resources to take care of yourself and your family, visit www.fcc.ca/wellness.